For a long time, value-conscious customers in Oman have felt the need for a trusted source for quality pre-owned vehicles. 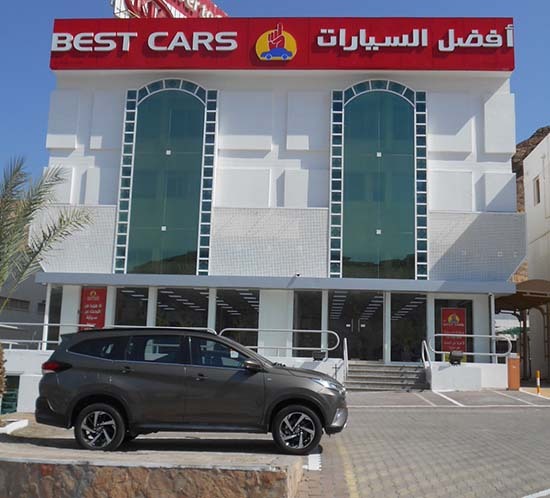 Saud Bahwan Group, tuned to customers' needs, set up Best Cars in 2001...'Best Cars' is a new standard in buying & selling quality, pre-owned vehicles. Best Cars' (main showroom) is located at the most convenient place in the heart of the automobile market in Wattayah, Muscat. Displaying a large number of quality cars at any given point in time, it is one of the most well-stocked facilities in Oman. Vehicles of all brands and models are available, offering a range that caters to every taste and budget, may it be Passenger Cars, 4WDs, Pick Ups or Commercial Vehicles. 'Best Cars' also provides financing facilities for customers who want to purchase pre-owned vehicles on installments. 'Best Cars' has a classy and comfortable ambience that makes it a pleasure to visit and shop around. In addition to the main showroom in Muscat, 'Best Cars' also has branches in all major towns of Oman. We buy well maintained cars less than 5 years old, SUV's and commercial vehicles of SBG brands ie. Toyota, Lexus, Kia, Ford & Daihatsu. Please visit us with your car in the basement of the Toyota Showroom in Wattayah and we will offer you the best price after a professional evaluation. Selling your car to Best Cars offers you complete peace of mind since you are assured of immediate payment and we assist you in all the documentation and other formalities. We also arrange for settlement of loan balance on the car if required. At Best Cars our basic philosophy has remained unchanged over the years - caring for customers by providing them with excellent customer service. No wonder that most of our business comes from customers referred to us by previous customers who are happy and satisfied with the comfort and peace of mind while dealing with us.